Many of us are using Google Analytics to measure the usual web metrics, but most of use are only using a small portion of this tool's functionality. It's common practice to send registered users an email to confirm account activity, to keep them up to date via a newsletter, or to try and encourage return activity. In many cases we are not really measuring how effective these mailings are or how they impact on our website traffic. At first glance it looks like a tricky problem, mail client applications will generally not pass a referrer and browser mail will be recorded as one of the hundreds of mail domains in use. Link Tagging is the simple solution, although there are a few options depending on how deep you want to go. By appending utm_source and utm_medium parameters to your links you can easily track who many visits are directly attributable to your mailings and see them in the All Traffic Sources report. Setting the utm_source value will replace any referrer value as the Traffic Source so random browser domains will be consolidated under one value, along with any email clicks with no referrer which would usually be classed as "(direct)". This is the only required parameter of this type, any other utm_xxxx fields used in conjunction with utm_source are optional. Using utm_medium=email is recommended, especially if you are using more than one utm_source value in different email types (e.g. 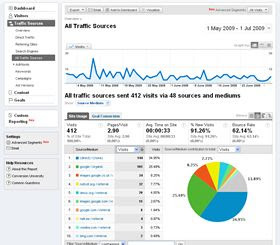 Newsletter, AdminEmail, ReferAFriend) so that you can easily filter the results on the All Traffic Sources report. Specifying a utm_campaign value can help group your links in a more meaningful way. This could be a sub group of your source categories (e.g. utm_campaign=200907 to identify this is the monthly Newsletter for July 2009) or you could use a campaign like utm_campaign=Winter-Sale across many sources (email, banner, CPC, etc). It all depends on what you want or need to measure. Whatever you choose, any utm_campaign values tracked will be displayed on the Traffic Sources->Campaigns report. These options are less common but still useful. Setting the utm_content parameter could help identify if text or html emails are getting more clicks. Alternatively you could track the comparative success of different creatives from the same campaign. utm_content values tracked will be displayed on the Traffic Sources->Ad Versions report. I've included the utm_term here just for completeness. It's usually used to identify search terms or keywords purchased. utm_term values tracked will be displayed on the Traffic Sources->Keywords report. Even if you're already tracking your email clicks with another solution, it's probably worth adding these parameters (or at least some of them). As long as they are passed to the landing page it doesn't matter if you add them to the pre or post tracking URL. You may do some special tweaks so that your tracking solution passes utm_xxxx parameters on to the destination URL. Usually I avoid this kind of post, but I thought this documentary was worth sharing with everybody. "Us Now" is a film project about the power of mass collaboration, government and the internet. I found it to be both interesting and inspiring and recommend watching it. It's also available in seven parts on YouTube if you can't use Vimeo.